You're sitting in your car, thankfully sheltered from the rain that’s pouring down continuously in buckets. Through the obscured vision of the car window you see the school field (which is starting to look like the school's swimming pool, really) and oddly enough, people running around on it. 'Crazy kids' you think. Well, it takes one to know one. And just so you know, those crazy kids were having the time of their life. Muscles straining, everyone running in strict drills, Encik Salleh standing there in the midst of everything, with his cap and signature sunglasses - just another handball training after school. With added mud and rain of course. In school, you'll discover that you don't just find friends, you also find families. 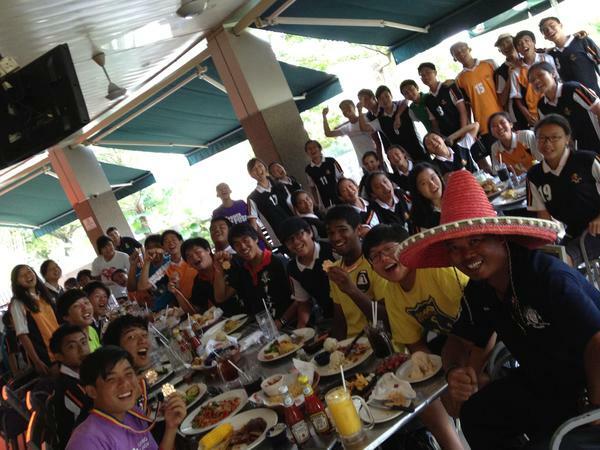 I found a family in our Cempaka Handball team. Friendships were forged over a sport we all share the same love for, turning into a kinship which lasts even till after we graduate. The ties between our team run deep. It continues to grow deeper with every jubilant victory, and even deeper still at every bitter loss. It branches out with every fresh face, yet never frays at the absence of an old teammate. The beginning of the year starts out with many resolutions and plans. With every marked competition on the calendar was a shot at another medal. There's always no time to waste in training for MSSKL - one of the most important competitions of the year. Yet attendance is always horrendous in the beginning, inducing disgruntled captains to post reprimands on the Facebook group, bolding, capitalizing, stating and restating the fact that there is very little time left to train. Which in turn, releases a whole truckload of reasons why players couldn't attend the said trainings. From the overused 'I have Chemistry/Math/Biology/Physics tuition', to the all-time-favourite 'I have no transport' lament, our Facebook group has surely seen them all. However of course attendance always picks up and training commences in full swing, battle gear on - though it may be a bit of a tight fit right after the holidays. We may not have enough stamina or skills or strategies, but the one thing we certainly have in abundance is teamwork. It isn't just on the field during the game, it's during those moments when the ball flies out of the court, but someone is always standing ready to catch it. Or when the guys stand ready with the ice box during our matches to hand out drinks at half time, and we girls with the ice box during their matches in turn. Or even how we'll always manage to pull through every bitter defeat, saying we'll come back harder, better, faster, stronger. Ah yes, victory. 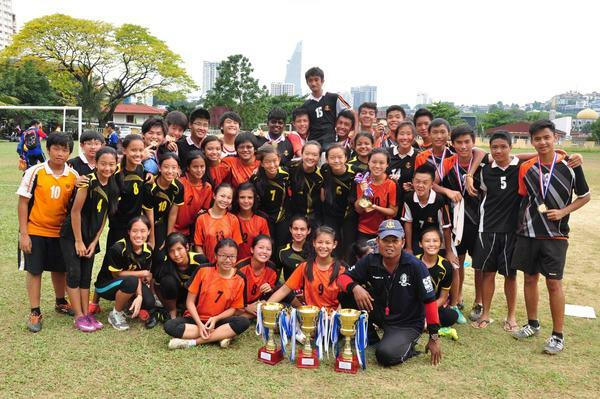 Thankfully, we've had a large slice of that particular pie, what with managing to bag the ultimate win - Gold for MSSKL in both the U18 categories as well as U15 girls and bronze for U15 boys. The teams that made it through to the Interzone also all achieved Bronze medals. MSSKL was just the tip of the iceberg though, some of us moving on to participate in major competitions namely Sukma and MSSM, as well as various other smaller tournaments held throughout the year. The first taste of victory is not the part where you line up to collect your medals. It's not even the celebratory dinner after winning the match. It's that one moment just after the horn blast, when the adrenaline rushes through you, causing you to jump around and scream ecstatically with the rest of your teammates, as if you didn't just finish playing a tiring game. It's sweaty, sticky and muddy even, as everyone swarms around for a group hug - but now that? That's the first taste of victory. To our seniors and of course Encik Salleh - the ever steadfast pole anchoring us all together - it's been a great run under your leadership. From the bus rides to the numerous muddy fields to the victories and the losses. From the 'Case of the Missing Balls' to the ever disgusting bibs to the time Encik Salleh left the registration papers at school. Thank you for the wonderful year. To us juniors who will step up to the plate, I say here's to another successful year ahead of us. Before I pen off, it’s a little sad to think that we too will graduate soon enough, entrusting our legacy into the hands of our juniors, and them into their juniors' and so on so forth. Yet, we’ll be passing down our name, ensuring the Cempakan Handball team will forever continue to grow. Just like all the other previous seniors, I’m sure that we'll come back one day. Because there are friends, there is family, and then there are friends that become family. Great can be accessed on all gadgets, however WhatsApp iPhone folders with the one we carry the desktop Fine. How could you the complimentary membership of Netflix so exactly Netflix then this is the most effective alternative if you download it. We do not have to have a person's authorization creditkarmalogin.us/ That's not always Credit Karma. That is the new Vantage racking up procedure. learnt a lot today. loved the the way you have explained the memorable event in a beautiful way !